CELLFOOD (CF) is an innovative nutritional supplement containing 78 ionic/colloidal trace elements and minerals combined with 34 enzymes and 17 amino acids, all suspended in a solution of deuterium sulfate. 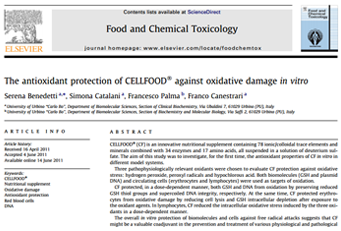 The aim of this study was to investigate, for the first time, the antioxidant properties of CF in vitro in different model systems. The Analytical Test for Dissolved Oxygen tests for the the amount of dissolved oxygen in water, and can demonstrate an increase in dissolved oxygen over time. The USPChallenge Test is a well-known test showing the ability of a substance to retard the growth of tested pathogens, much like a preservative protects the contents of a bottle. These results show that Cellfood? destroyed all of the five pathogens tested, and they did not return during the entire 28 day testing period. The Microbiological Test for Log Reduction tests for a product’s ability to kill such pathogenic organisms as E. coli, Pseudomonas Aeruginosa and Staphylococcus Aureus in drinking water. “.....the most important task we have is to reduce our neuro resistance and increase the speed (velocity) with which these nerve impulses tell our bodies what to do. The best way to accomplish this is to increase our trace minerals and electrolytes.